There’s nothing like cooking with fresh ingredients and while you might not be able to grow your own vegetables indoors, there’s always room for fresh herbs. That’s why we think everyone should have their very own indoor herb garden. It’s easy to maintain and it doesn’t take up a lot of space. You can grow the herbs in pots which you can keep out on the balcony or even in the kitchen. Curious what herbs you can grow indoors? We’d be happy to mention a few. The most common ones include parsley, mint, lemongrass, dill, chives, cilantro, sage, thyme, oregano, rosemary, basil but also lemon balm, chervil, garden cress and even catnip. Some need shallow container, some can adjust themselves to grow in small pots and some require plenty of soil so do a bit of research before planting. After that, you can start thinking of how you’ll be displaying and storing the herbs and that’s where we can help the most. 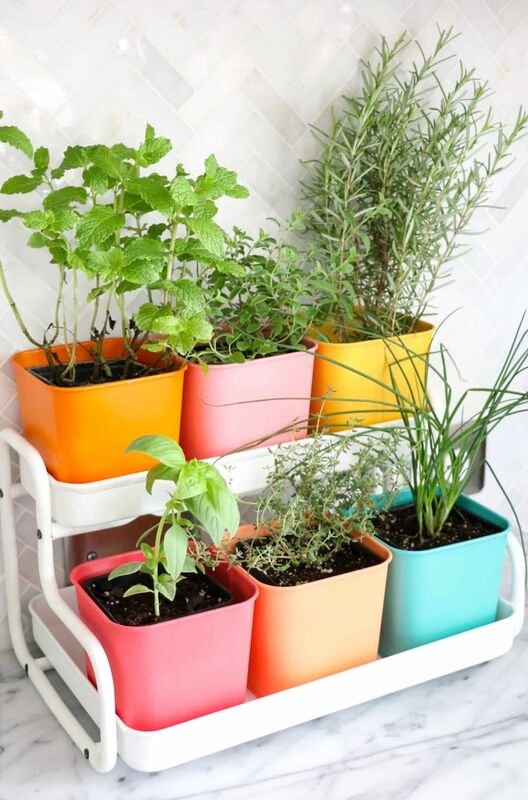 Check out some of the cutest and most practical and stylish indoor herb garden ideas we could find in the examples below. Every little bit of space is precious, especially in areas like the kitchen so there’s no point in wasting any when you can hang your herb garden and leave the counter for prepping and other activities. 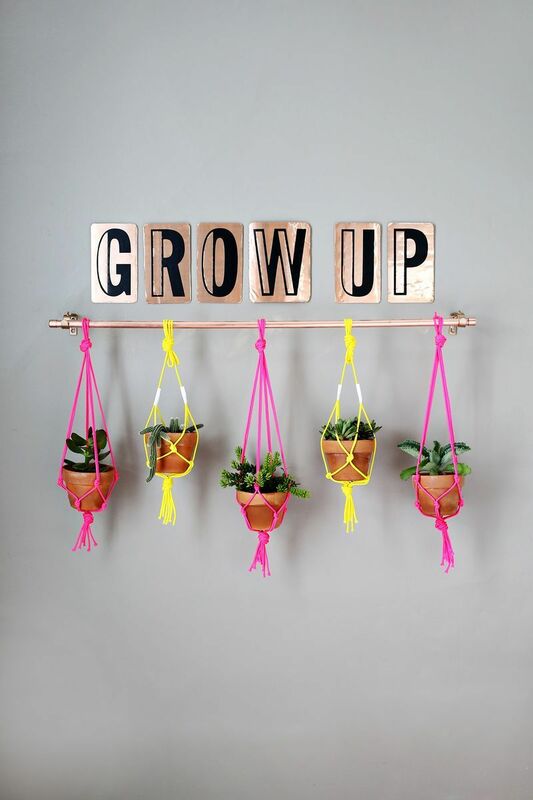 You can create a simple hanging planter system yourself using a wooden rod and some rope. You can find a tutorial for that on bunker and you can use it not just for herbs but for indoor plants in general. A really cute idea can be to plant herbs in matching pots of different colors and to group them all up on shelves or to organize them in a way similar to what you can find on abeautifulmess. This simple system keeps the planters neatly and practically organized in trays on two tiers. You can put together the frame yourself and you can adjust the measurements according to your own preferences. A wall-mounted herb garden would be a very practical idea too. You can build a frame out of wood and it can look like the one featured on shanty-2-chic. 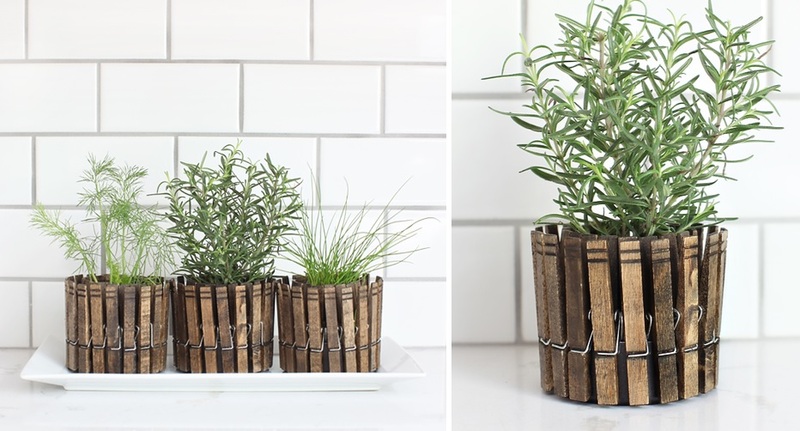 The design is simple and lets you easily add this planter system to any room of the house. Installation is easy as well and the possibilities for customization are numerous. For instance, you can choose to stain or to paint the wood so it matches other elements in the room. 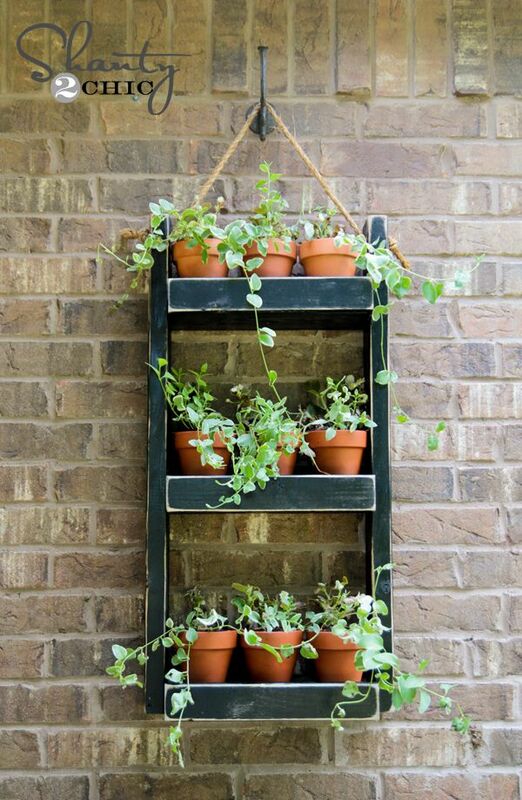 Of course, building a shelving system for your indoor herb garden is entirely optional. You could focus instead on making the planters look cute and beautiful and simply keep them on the windowsill, on the counter or on any other existing surface. 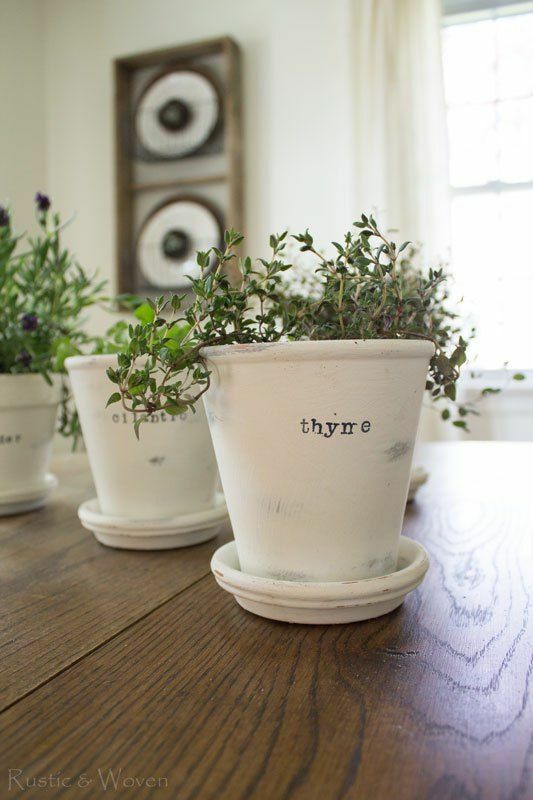 A particularly cool idea is to use chalk paint and to customize each planter with the name of the herb they hold. Check out rusticandwoven for instructions. On 7thhouseontheleft you’ll find instructions on how to make cute little herb planters out of empty tin cans and wooden clothespins. There’s nothing special about it…just attach clothespins to the outside of the can, creating a sort of tiny fence. You can also use this as a votive, not just an herb planter. The copper pipe hanging system featured on abeautifulmess is one of the easiest DIY projects ever. 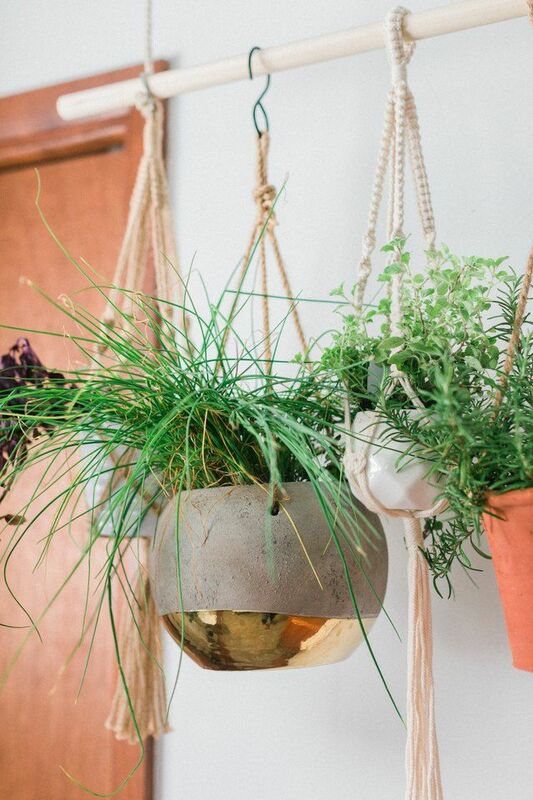 It’s not just great for hanging herb planters but for a lot of other things. You can even add a rod like this one in the laundry room and use it to hang clothes. In any case, once you have the rod in place you should focus on making those colorful cord plant hangers. Pick any colors you think would look best in your home decor. Windowsill planters are super practical for a variety of reasons such as the fact that the windowsill is actually a perfect spot for them. These planters are also easy to craft, assuming that you prefer a handmade design. The project from oliveandcocoa shows you how to grow a small herb garden from scratch. The planter is simple and cute and lets you grow everything in one place. 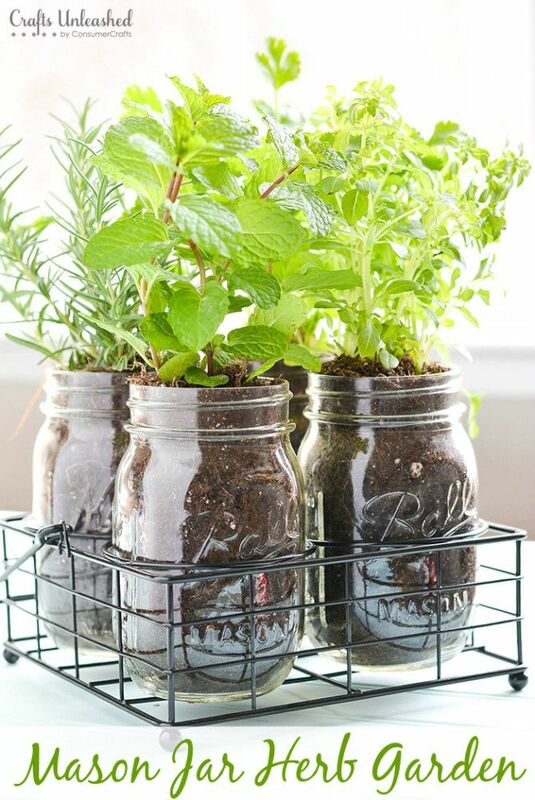 Some herbs and plants will grow in just about any type of container which means you can even use mason jars for that. The jars can be left transparent so you can see the soil inside or can be painted or decorated with fabric. You can group them all up on the windowsill or you can keep them on shelves. Another options is to make a custom metal basket like the one featured on consumercrafts. 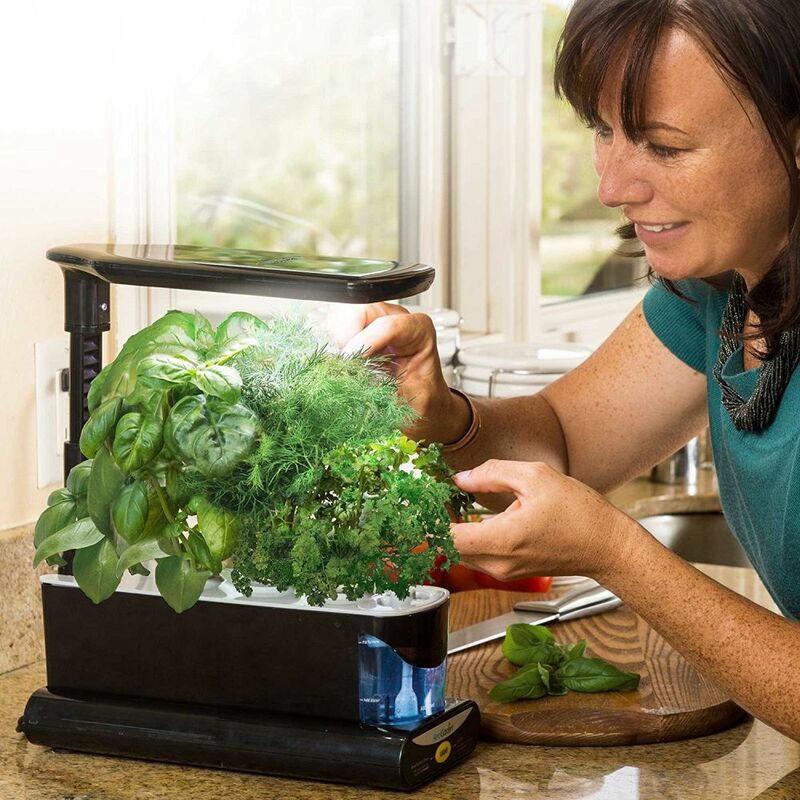 If you’re super serious about your indoor herb garden you might want to think about investing in something a bit more fancy, like this AeroGarden system which lets you grow up to three plants in water. It features a smart and user-friendly control panel which turns the lights on and off and even reminds you when it’s time to give the plants nutrients. 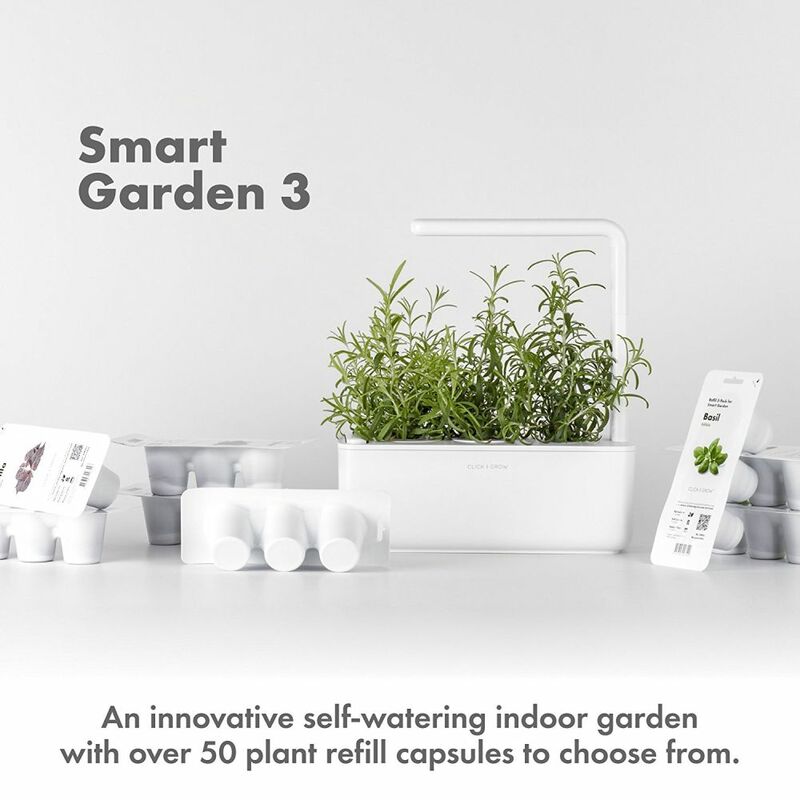 Another cool option is the Smart Garden 3 which takes care of everything for you and lets you grow healthy and beautiful herbs and plants without having to worry about maintenance. You just drop the plant cartridges into the container and you fill the reservoir with water. After that you just plug the planter in and that’s it!. But what if you want to grow more than just parsley and thyme? What if you also want to grow vegetables like salad or peppers? Then you’ll need something bigger. We suggest the Vertical NFT Hydroponics Growing System. 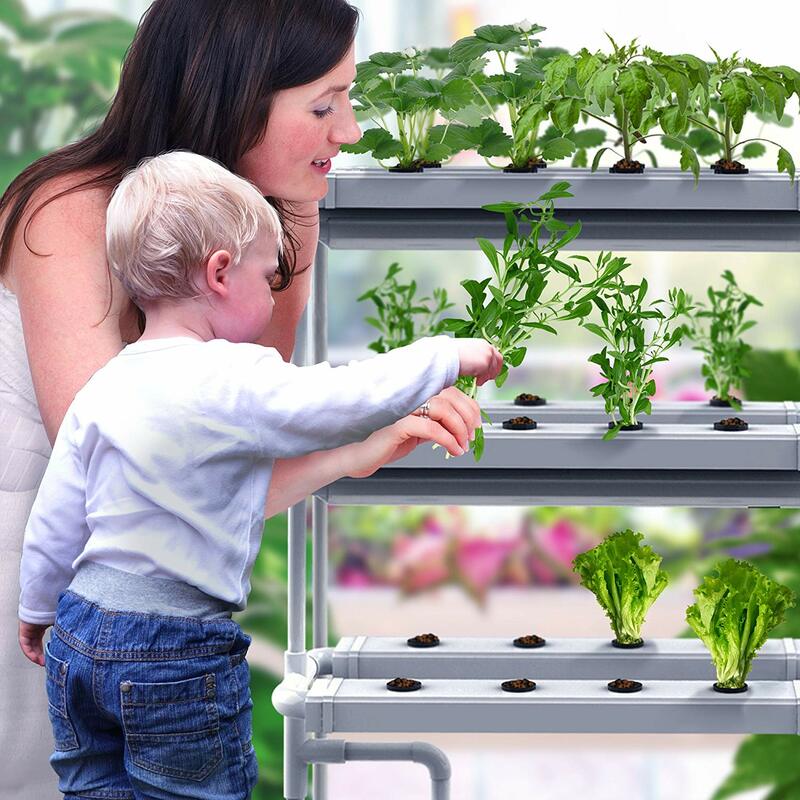 It lets you grow up to 24 fresh herbs and plants without any soil and with very little effort. 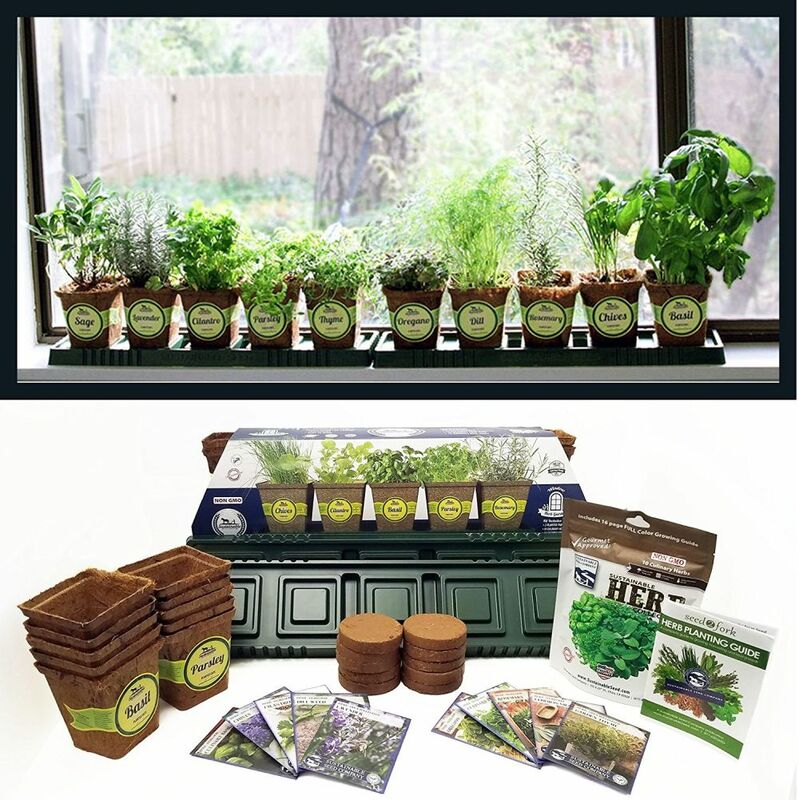 You want to start your own indoor herb garden but you don’t know where to start from? 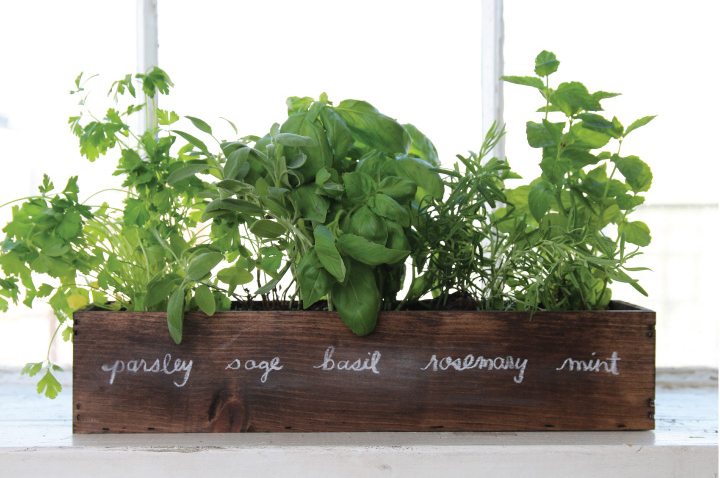 This Windowsill Herb Garden Kit is just the thing you need. It contains everything you need including herb seed packets, pre-labeled pots and potting mix. All you need to do is add water. You’ll also get instructions and tips for setting up your new windowsill garden just the way you like it. The post How To Grow Your Very Own Indoor Herb Garden – Tips And Ideas appeared first on Home Decorating Trends – Homedit.